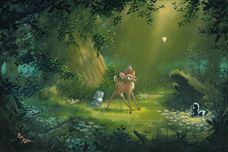 Bambi is an animated feature produced by Walt Disney and originally released to theatres by RKO Radio Pictures on August 13, 1942 during World War II and was Disney's 5th full length animated film. 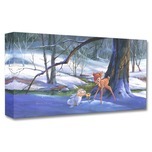 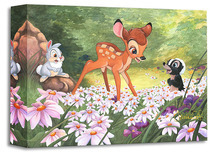 Bambi is based on the 1923 book "Bambi", A Life in the Woods by Austrian author Felix Salten. 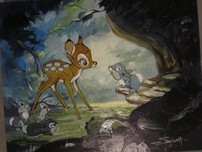 The main characters are Bambi, his parents, his friends Thumper, Flower, and Bambi's childhood friend and future mate, Faline. 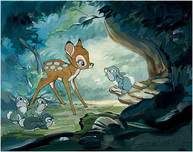 For the movie, Disney took the liberty of changing Bambi's species into a white-tailed deer from his original species of roe deer. 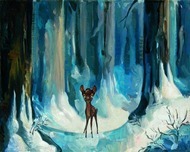 Bambi was re-released to theaters in: 1947, 1957, 1966, 1975, 1982, and 1988. 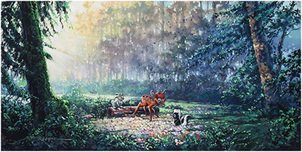 It was released on VHS in 1989[Classics], 1997[Masterpiece], and remastered and restored for the March 1, 2005 Platinum Edition DVD. 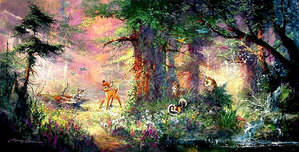 The Platinum Edition DVD went on moratorium on January 31, 2007. 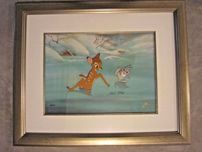 Remember every time you purchase a Bambi artwork over $995, shipping is FREE in the continental U.S. and there is NO SALES TAX when you purchase outside of Colorado. 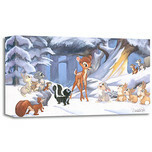 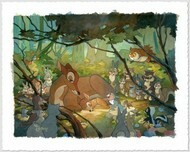 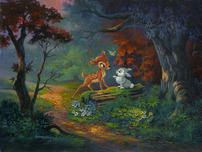 We SHIP WORLDWIDE and offer Layaway for Bambi art.